Despite not boasting an overly impressive set of results to date, the model rates Liverpool's defense quite highly and thus perennial captain option Lukaku is well down this week's rankings. Morata is a injury risk which is unfortunate given Chelsea's visit to lowly Palace, although even if fully fit the model is not enamored with the Spaniard thanks to so-so shot data for Chelsea on their travels. While they've racked up a very impressive 8 goals in 3 games, they've done so on just 21 SiB and 12 SoT, which makes the model cautious of future regression. For context, Arsenal have 20 SiB and 8 SoT in their three away trips and have yet to score. With Aguero out and City at home, Jesus is a very real option and I might have him second on my own adjusted list. He gets a good share of City's chances when on the pitch (24%) and while his SiB numbers cannot match the likes of Kane or Lukaku, his Big Chances per 90 minutes are right up there and he looks well placed to get on the scoresheet again. Of course, going by the model that is all moot, as if you own Kane you will surely captain him. The only question is whether or not to give him the triple captaincy. The model ranks this as tied for his second best fixture in the next 12, with the top option strangely coming on the road thanks to Watford's stupendously awful defensive start to the season (41 SiB surrendered in three games with a SiB- +/- of 61%). Gun to my head I'd play the odds with the GW11 fixture at home to Palace but the certainty of knowing Kane is fit right now, and not coming off a massive fixture against Real - as he will be in GW11 - is not to be ignored. The left field (well, left back, (sorry)) option based on the model is Ben Davies - who is now widely owned but not necessarily considered in the same light as his more esteemed colleagues. However, the model gives Davies a ~40% chance at a clean sheet, a 60% chance at an assist and a 20% chance of a goal so one might argue that the chance of him drawing a 2-point blank is arguably lower than Kane (who has done so four times this season). Again though, it's very hard to ignore Kane. 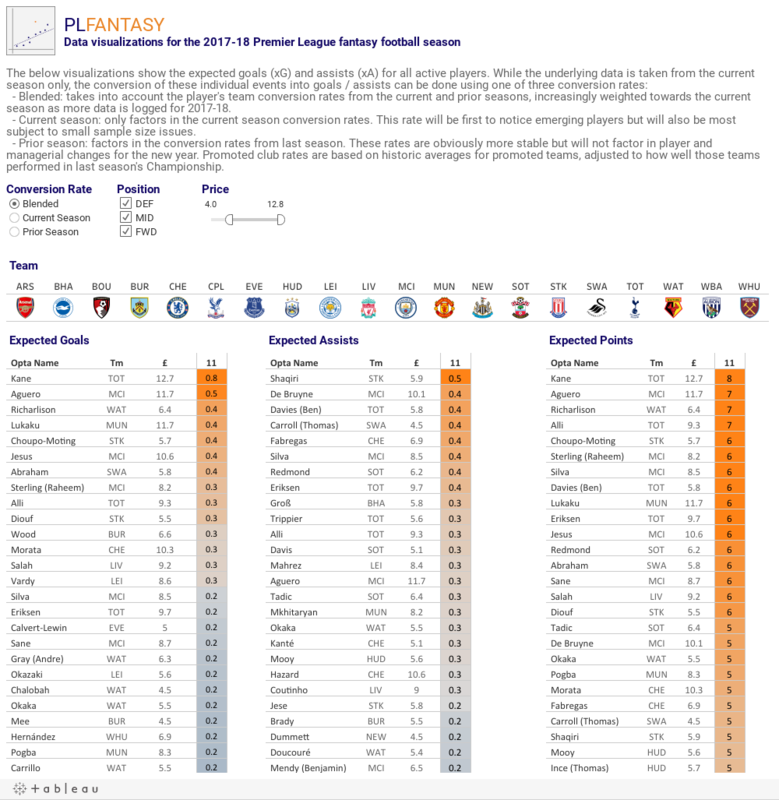 If your team is in good shape then you might have the privilege of bringing in a player for just one or two gameweeks. For example, I knew I wanted Sterling in the medium term in place of the ineffectual Mahrez but with City travelling to Chelsea and United facing Palace at home I brought in Martial as a one week loan (with so-so results as Martial was limited to bench duty but did manage to nab a sneaky assist). This week there is likely to be plenty of movement among elite forwards with injuries to Morata and Aguero, and uncertainty around Lukaku's status (not to mention a tricky trip to Anfield). As noted above, Jesus is the obvious pick and I see him as more than a one or two week play but many managers - including your lowly blogger - are already maxed out on City options so would need to look elsewhere. I know Vardy has received buzz in this category but he has his own injury issues and so I'm going to go with Lacazette as a player I might target for 1 - 3 gameweeks while I wait for the dust to settle after the turmoil among the other elite forwards. His numbers don't generally blow me away but Watford has been miserable at home and with Ozil and Sanchez potentially both in the side, the chances should be plentiful for the Frenchman. Wow, there's so much information! I'm sure it was really hard to analyze all this data. It's really cool that you managed to make everything so good. I could never be so productive. I'm glad I could at least check the review of InstantAssignmentHelp.com.au and hire them for my needs.